As part of their Winter Season Chichester Festival Theatre will be hosting a performance called ‘Spotlight on the Edge’ to support the work of local charity Children on the Edge. CMA acts smash it on Main Stage at ROX Festival! Callum Peyman, Anna Foye, Dan Coates, ROUTE, Urban Legend, BASIS.. awesome performances on a massive stage.. Well done guys!! An awesome Summer Showcase at Aldingbourne Country Centre yesterday, thanks to all the performers and for all the support! 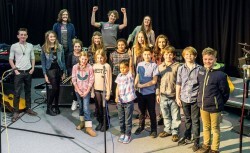 Over 60 children took part in 3 live shows at Chichester College. Very well done to all who took part, and a big thank you to those who came to watch and to the Fraser, Tom, George, Netia, Ella, Evie and Kevin for their time. CMA tutor Tom Truman will be performing his Jazz compositions at the Chichester University on Thursday 12th Feb. Bishop Otter Campus, Chapel of Ascension 7pm. Free admission. Donations in aid of the Snowdrop Trust. Latest news and event announcements will be posted here on a regular basis. You can also subscribe to the Chichester Music Academy Website at the bottom of the page and receive regular updates via email.